Preheat oven to 375°. Spray a 9 x 13 baking dish with cooking spray. In a medium bowl, stir together crab, shrimp, ¼ c salsa, ½ c Mexican blend cheese, ½ c cojita cheese, and sour cream. Spoon about ⅓ c of this filling down the center of each tortilla, fold sides to the middle to cover filling, and place rolled enchiladas seam side down in the prepared baking dish. Enchiladas should fit tightly together in the pan. Slowly add chicken broth about ¼ c at a time, whisking constantly to keep mixture smooth. When all chicken broth is added, bring to a simmer. Stir in chili powder, cumin, salt, ½ c Mexican blend cheese, ½ c cojita cheese , ¼ c salsa, and half and half. When cheese is melted, turn off heat and pour sauce evenly over prepared enchiladas. Cover dish with foil, and bake for 30 minutes. Remove foil, and sprinkle remaining cheese over the top. Bake an additional 5-10 minutes until cheese is melted and bubbly. You can also place it under the broiler for 5 minutes, but keep an eye on it so the cheese doesn’t burn. 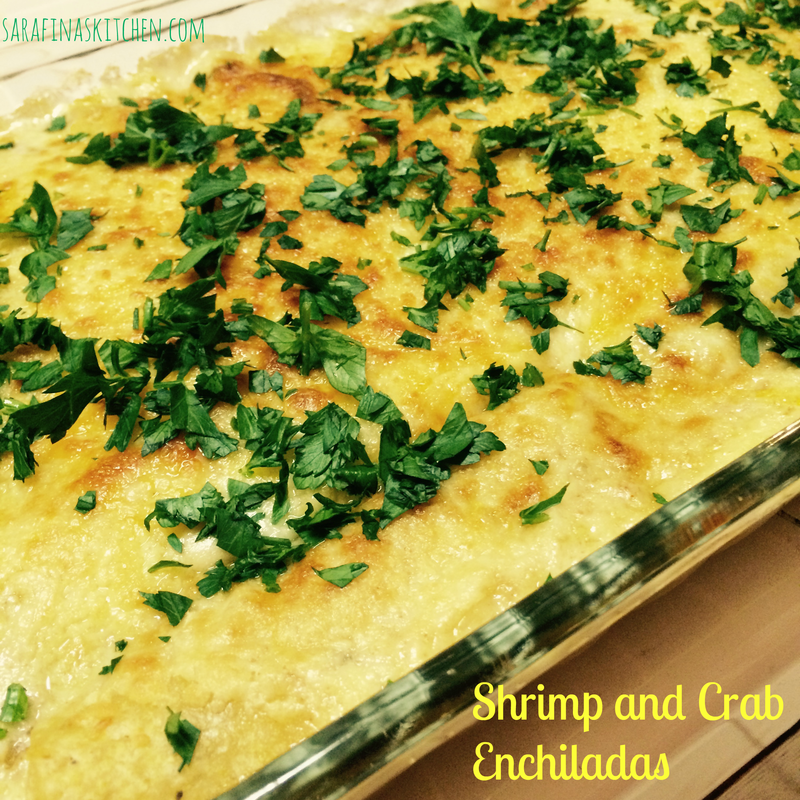 Serve enchiladas and garnish with chopped parsley if desired. Just give me a fork. This looks so fantastic.